What defines a professional is how you contribute to the profession. CAHME’s nearly 50 year history is based on the commitment of practitioners and academics. This past week, I got to see that in action at two events. 43,000 professionals gathered in Orlando at the annual HIMSS conference. HIMSS is a longstanding corporate member of CAHME. At the conference, I saw remarkable applications, particularly those from two CAHME award sponsors, Canon and Cerner. Epic, who provided a donation to CAHME last year, presented their “Healthy Planet” module. While these organizations give back to the profession through CAHME, it is obvious that they are furthering healthcare management with innovative services. CAHME is thankful for their support. At the end of the week I went to the University of Alabama at Birmingham (UAB) Health Administration Case Competition. Students from 39 CAHME accredited programs sent their best and brightest to participate. The team from Boston University Questrom School of Business won among a talented group of finalists that included the University of Alabama, George Mason University, University of Washington, University of Florida, and Ohio State University. The case featured Bon Secours Baltimore Health System, serving a socio-economically challenged West Baltimore. Thanks to Maha Sampath, Bon Secours Director of the Health Enterprise Zone, and a graduate from CAHME-accredited The George Washington University for her efforts in putting the case together. Top left: Frank Coyne, CAHME Board Member, confers with other judges in preparation for the UAB Case Competition. 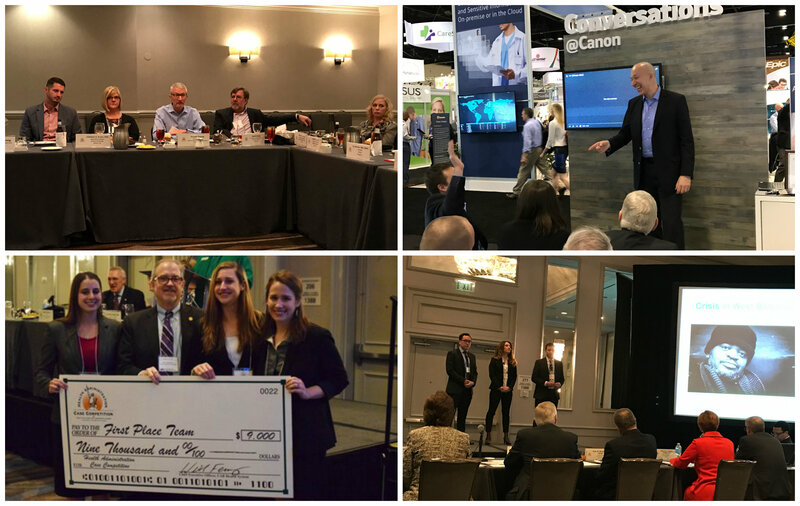 Top right: I describe how the CAHME-Canon Award encourage sustainability in our programs at the 2017 HIMSS Conference. Bottom left: The winning Boston University program team. Bottom right: A memorable emotional presentation from another finalist, the team at the University of Washington. An event like the UAB Case Competition happens only with the commitment of dedicated professionals, which is evident from the support from UAB Health System CEO Will Ferniany whose system financially supports the event. The UAB School of Health Professions team, notably Christy Lemak, Randa Hall, and Denise Hamilton, put in a lot of extra hours in coordinating the details. As to the faculty advisors…well, let me say that this was a shining moment for you. Your commitment was evident in the performance of your teams. And the pride that shown on your faces was no less than that of a parent watching their children succeed. Professionals such as CAHME Board Member Frank Coyne were among the luminaries who donated their time as judges. To me, “coach” may be a better term, as they served to not just evaluate the teams but also to provide advice. Think of the TV show “The Voice”, but temper that with how students from these teams will have long term impact on the profession of health care and the communities that they serve. While a week living out of a suitcase is not much fun, it is invigorating knowing how much executives care about our profession, how dedicated our faculty are to educating the next generation of healthcare leaders, and how promising our young people are who take up the noble cause of providing healthcare. We are all the better because of it. 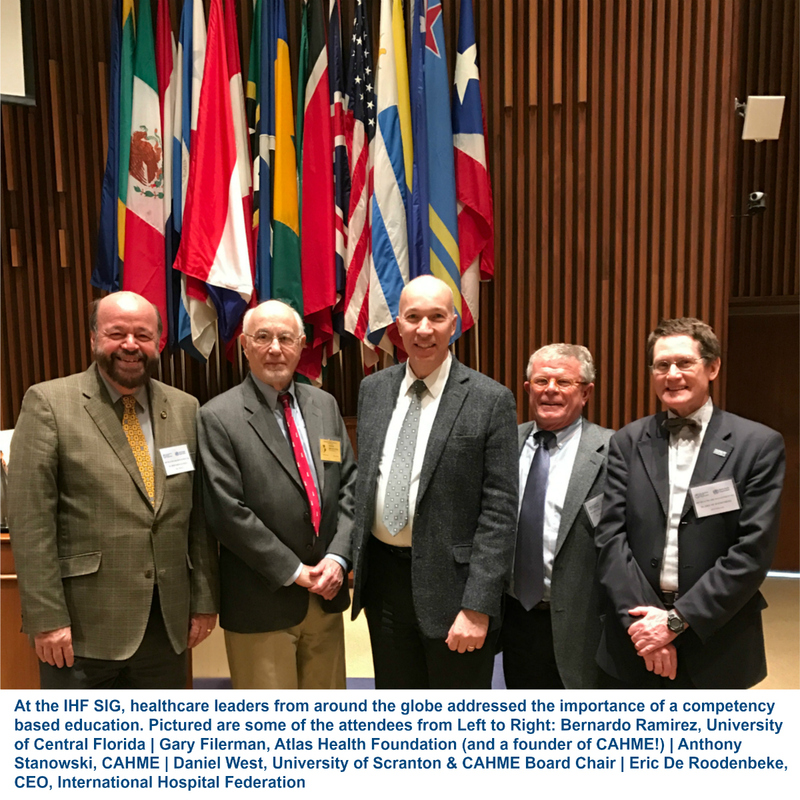 I recently attended the International Hospital Federation Special Interest Group (IHF SIG) on hospital management competencies held in Washington, DC. The group discussed the importance of competencies to ensure that healthcare managers had the skills needed to lead healthcare systems globally. We agreed that accreditation is a conduit to success, and must not be a barrier to entry. At its best, accreditation helps to pave the way for higher education to keep pace with the demands of future economies, to ensure that the skills valued by employers are the same skills that students receive in the classroom. Accreditation is essential! Education is changing, and many programs are using new business models and new teaching approaches that lower costs while promoting a quality education. Our Standards Council composed of both practitioners and academics reviewed the CAHME standards and released the 2017 accreditation criteria. The 2017 CAHME accreditation criteria clarifies many existing standards and eliminates redundancies. For example, CAHME’s Eligibility Requirement D had stated: “The Program will require full-time study beyond the baccalaureate level of not less than the equivalent of two academic years as defined by the University. CAHME will evaluate whether the Program, as defined by the University, meets this requirement.” However, this requirement did not account for programs that leverage undergraduate coursework with graduate requirements. At the Accreditation Boot Camp at ACHE Congress, the 2017 Standards Criteria will be discussed in the context of the Accreditation process. Register early. Because of the introduction of the new standards, about half the seats for the session remain.